You can choose from a wide selection of children things to do in Budapest including ones that the whole family will enjoy. 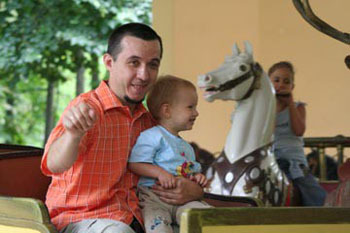 So don’t hesitate to bring your kids with you to explore the Hungarian capital. There are both outdoor and indoor places of entertainment, and things to do for kids; so no matter what’s the weather like you’ll find something interesting for the whole family. try the best artisan ice creams. or see movie in a cinema. The city also offers a wide choice of events and festivals that are great fun for the whole family. 50 % discount to the CsoPa (Center of Scientific Games) & CsoPa Playbar, and many more benefits! Address: Király utca 26. Budapest 1061, district VII. TIP: It’s best to get your tickets in advance to avoid queuing. See the event’s official website for more info. The Gold of the Incas is a spectacular and fun educational program for the whole family (recommended for kids 6 yrs and up). The amazing display covers the history of the famous Andes nation, the Incas through hundreds of artefacts including 150 original items, on 2 500 sqm. Budapest has some lovely green areas where you and your little ones can enjoy the fresh air and numerous fun activities. Take your children to the City Park (Városligeti Park) the largest green are of the city (currently being revamped with new museums, leisure activities added, it will be finished in 2018). Széchenyi Bath with outdoor pools (see other bath recommendations below). You can find the City Park on Budapest City map marked 9. Don’t miss rowing on the lake in summer, or ice skating in winter. You can see the tower of the charming mock castle, Vajdahunyad castle from Heroes’ Square. The castle introduces you to Hungarian Architectural styles. It houses the Agricultural Museum and often hosts event/festivals for families with kids. TIP: The castle also gives home to summer concerts on Monday and Thursday evenings in July and August. The Park also offers some fine family-friendly restaurants, see our restaurant recommendation below. How about taking your kids on a boat tour on the Danube? Both you and the kids will enjoy the scenic view on the gently gliding, air-conditioned ship. 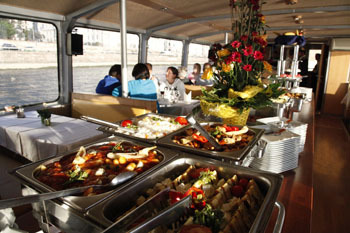 Unlike the Snow White Heritage Boat recommended above in summer months, on this tour you can get tasty food and drinks on board. Even vegetarians will find dishes from the selection of the buffet lunch or dinner. But if you don’t want to eat you can book the tour without meal/ with drinks only. The lunch tour departs at 14.00 and it’s is 1,5 hour long, which even smaller kids tolerate well. The boats are air-conditioned so you can have a great time in any weather. The panoramic windows provide a nice, clean view of the river and the sights on its banks. A Ride on the Eye – It’s Up Again! The large ferris wheel on Erzsébet tér in the city centre will sure attract many kids. The 65 m high new structure operates every day all year, from 10.00 – 24.00.
family ticket (2 + 2): 6 900 HUF/23 EUR. 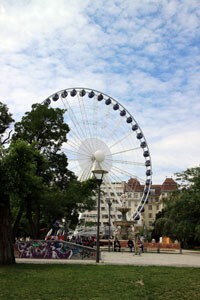 Find out more details about the Budapest Eye. I don’t know about your kids but our son is a water fanatic. Luckily the Hungarian capital is a city of baths, and nothing is more refreshing on a hot summer day than splashing in the waters. TIP: The Palatinus is our favorite outdoor bath located on Margaret Island. It has 11 pools, plenty of slides, and a fantastic scenery. It has an indoor section with children’s pool, thermal pool, plunge pools so the bath is open all year round. See a list of the most popular beaches/lidos in Budapest. The good news is that bathing is not restricted to summer months only, because several thermal baths operate in the city throughout the year. 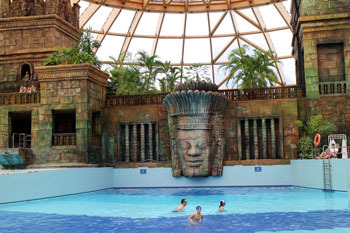 See also our page about Budapest Spas. I recommend taking the waters in the Széchenyi Bath (it’s in the City Park so you can combine bathing with visiting the Zoo, and the Amusement Park). The Aquaworld is a fantastic water theme park in the northern part of Budapest (address: Íves út 16., district IV., near the Pest bridgehead of the Megyeri bridge on the M0 ring road). It is a bit far from the city centre but it can be accessed by a shuttle bus (bus No. 230) from Heroes’ Square that runs every day. The journey takes about 30 minutes. See the bus timetable here. Besides the exciting slides and activities, Aquaworld has a range of great programs for kids: baby swimming, a summer camp, a playhouse. 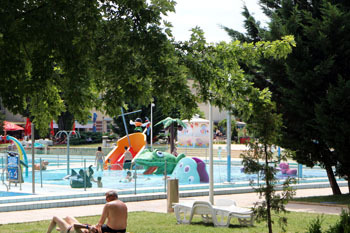 Although it’s outside the city, the Aquarena Water Park at Mogyoród is a real pleasure especially on a sultry day. Mogyoród is a small village some 20 kms northeast of Budapest, you can get there on the M3 motorway. TIP: The F1 Hungarian Grand Prix is held at Mogyoród, usually at end of each July. The idyllic Margaret Island in the Danube’s embrace is ideal for leisurely walks. listen to the music of a lovely fountain (completely renovated in 2013.). TIP: see also our detailed guide to the most popular Budapest attractions. You can rent the bringóhinto on the island. In summer you can refresh in the open-air pools of the Palatinus Beach (see photos above) that has a wave bath, slides, neck massage. 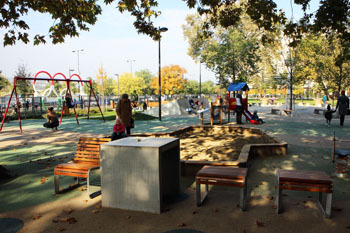 Several playgrounds and sport activities provide for further entertainment. Budapest has some more lovely parks: the Károlyi Park, and the parks at Erzsébet tér, and Szabadság tér are located in the city centre. The Olimpia Park is a lovely playground right on the Danube bank ata short distance from the Parliament to the north. It has a couple of great slides, and other toys, fountains, a fairly large grass covered area and marble plaques with the names of all of Hungary’s summer Olympic games gold medalists on them. The tricolor Olympic rings bronze statue is not very artistic but the view of the river and the Buda side compensates for it. 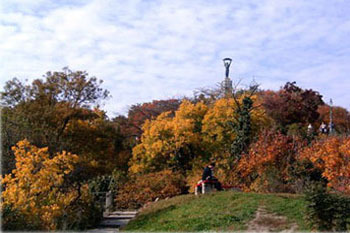 If you love hiking go up the leafy Buda Hills, the lung of Budapest. You can travel up in the hills by uncommon vehicles like the Children’s Railway, the Chairlift (Libegő) or the Cogwheel Railway (Fogaskerekű). They make the trip interesting and fun. 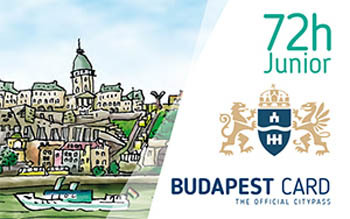 Note that an excursion to the Buda Hills is a couple of hours program, so take food, snacks and drinks with you (although there are a a couple of buffets along the way). 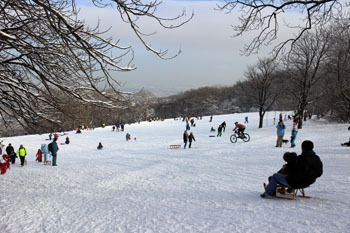 The Buda Hills, especially the Normafa area, can be lots of fun in winter when thick snow covers the slopes. Normafa is the locals’ number one favorite spot for skiing and sleighing. 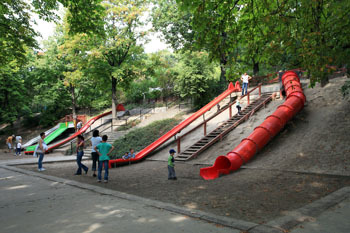 The Gellért Hill is great fun too for families with kids. The hill is easily accessible from the city centre and has great parks and playgrounds. Europe’s largest Skate and Leisure Park, the Görzenál in the III. district is skaters’ paradise. The park has been awaiting active sports lovers since 1995. Besides skating, you can do BMX riding, wall-climbing, jumping on trampoline. Location: Tatai utca 95., district XIV. 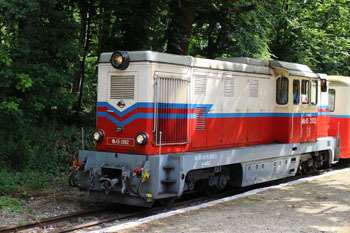 Vintage locomotive and railcars and a lots of activities await kids and their parents in an awesome outdoor museum, the Hungarian Railway Museum (see opening hours, tickets). 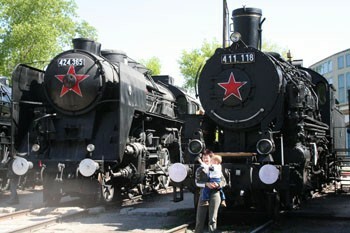 TIP: on Children’s Day (last weekend in May) entry is free to the Railway Museum for children and there are be lots of great programs for kids and adults alike. Address: Andrássy út 39., district VI. The Future Park, an intercative experience center, is the city’s newest attraction housed in an amazing building on Andrássy Avenue. Visitors – whether kids or adults – will experience a magical world where free thinking and team work help improve creativity and kids can learn playfully. 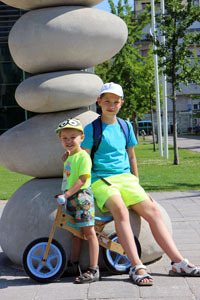 The Miniversum is the newest attraction for kids located on the ground floor of the Krausz Palace on Andrássy Avenue. The 300 square meter interactive train table opened in mid-May 2014. You can explore the best known sights of Austria, Germany and Hungary. There’s also a playhouse with 5 modeling tables for 5 different age groups. You can have snacks, sandwiches, drinks in the coffee shop. See ticket prices and opening hours in the Miniversum. The center of Scientific Wonders (Csodák Palotája/CsoPa), located in Campona Shopping Center provides interactive entertainment on 1 700 sqm (at the Campona location) that grown-ups enjoy as much as children do. Recommended for kids from ages 4 and up because some basic science knowledge taught in elementary school is required to fully enjoy the games! There are some building blocks and such for toddlers but the Center is geared more toward school children. Campona Shopping Centre: Nagytétényi út 37-43., district XXII. Getting there: H5 suburban railway from Batthyány Sqr, Buda (M2 metro), get off at Szépvölgy út stop, trams No. 17, No. 19 Kolosy tér stop, buses No. 9, 29, 109, és 111, 165, 934, and 960. Parking: if you come by car you can park in the garage of the Buda Entertainment & Gastro for a fee. 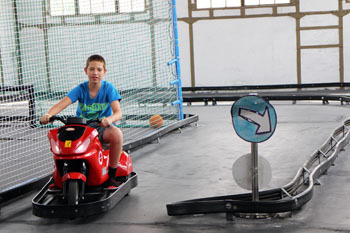 If your kids still have energy to explore other activities, you can visit plenty of indoor attractions. The centre offers a wide variety of hands-on scientific games (around 100) and experiments that help your children understand scientific rules and facts in a playful way. Hungarian and English-language guides placed next to each game explain how to use the games and what scientific phenomena, rule it demonstrates. There are also cool Physics Demonstrations 4 times a day in the Öveges Room starting at: 11:00, 13:00, 15:00, 17:00 (these are presented in Hungarian). The second location of CsoPa opened in the northern part of the city, in Óbuda district in May 2016. Visit the CsoPa’s official website for more information on programs. Address: Nagytétényi út 33-43., district XXII. Opening Hours: every day: 10.00 – 20.00 (last entry at 19.00). Holiday opening hours may differ. Visit the Tropicarium, a spectacular Aquarium also in the Campona shopping mall, to admire nature’s wonders, sharks and other interesting fishes and tropical creatures from close. hosting festivals (the Gourmet Festival in May) and other events. 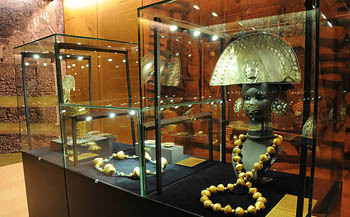 This unique exhibition is in building “B”. 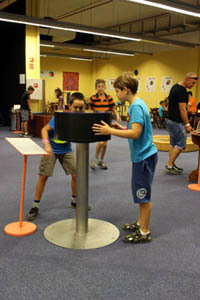 It is a an interactive display where you find your way around and gather information using only touch, scent and sounds. A blind or partially sighted person will walk you around in 7 display rooms. The aim of the exhibit is to help people understand how blind/visually impaired people cope in life. On saturday, Sunday and Public Holidays tickets cost slightly more: full price: 1 990 HUF, children/retirees: 1 700 HUF, family: 5 400 HUF. 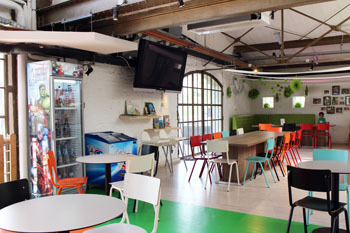 You can have a nice, kid-friendly meal at friendly price in the cafe on the 3rd level. 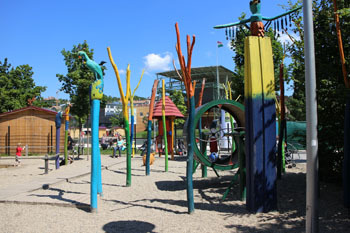 The park also has a playground (Zöld Péter Játszótér) themed around a Hungarian folk story Zöld Péter. Benches are palced in shades provided by bushes and trees so you can take a rest if it’s too hot in summer. There’s also a drinking well should you run out of water/fruit juice (or didn’t think to pack). In the Laser Theatre of the Planetarium impressive laser shows introduce the secrets of stars and the universe to you and your children. For English shows registration is required in e-mail. Famous singers’ and bands’ music accompany the visual display: hits from the Queen, Pink Floyd, Vangelis, Carmina Burana and even Madonna make the show an unforgettable experience. 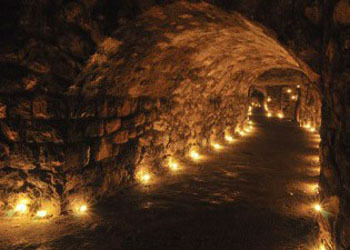 The Labyrinth of Caves in Budapest Castle District is another enthralling attraction for kids in our capital city. The labyrinth with some great interactive programs is open from 10.00 till 19.00 every day. The night time tours by the light of a lantern starting at 18.00 are definitely thrilling. TIP: There is also a playhouse called Labirintus Háza every Sunday between 10.00 and 13.00: a mystic treasure hunting for an unforgettable experience. Great for rainy days! Learn about the programs in the Labyrinth here. 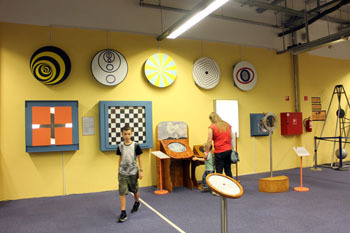 The Mesemuzeum (pronounced Mesheh-museum) is an interactive, indoor adventure space for young children to run, play, and explore the basic elements of fairy tales. Individual visitors are welcome Thursday and Saturday from 10.00 to 18.00, and Sunday from 10.00 to 14.00. Appointments by group can be made for Tuesdays, Wednesdays, and Fridays. Weekly camps and workshops with different themes are also available. 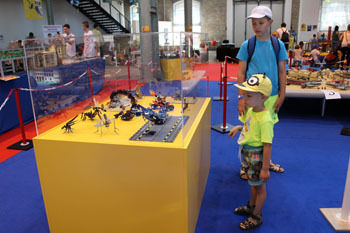 The Hungarian Natural History Museum (Magyar Természettudományi Múzeum) has interactive exhibitions to entertain and educate kids. 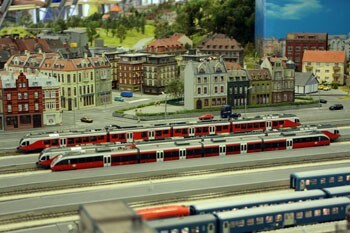 An outstanding collection of transport history with unique railway models. Boys and dad’s can spent hours in this museum. Note: the Museum is closed till 2018 due to a large-scale re-building project of the City Park (commonly known as the “Liget Projekt” in Hungary). But let’s not forget about Moms, the Museum of Commerce and Catering (Kereskedelmi és Vendéglátóipari Múzeum) recreates the atmosphere of Budapest’s turn-of-the-20th-century commercial boom. The museum is in Óbuda, at Korona tér 1., district III. Visit the website of the museum for up to date information. Browse our list of Budapest Museums. Budapest hosts a couple of Advent Festivals and Festive Fairs offering lots of free programs for kids and their parents between the end of November and Christmas/New Year. The best-known such fair is at Vörösmarty tér. It has a charming wooden cottage playhouse where craft activities await kids Friday, Saturday and Sunday. 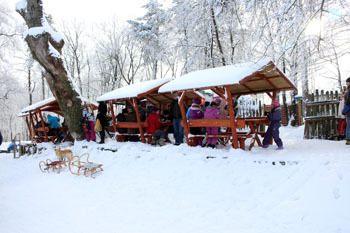 The Winter & Advent Festival in Városháza park in the city centre has concerts and puppet shows on Advent weekends. A free ice rink and training on weekends ensure great fun on the Advent Festival at the Basilica. Skate rental is available. concerts are the main attractions for families with kids. 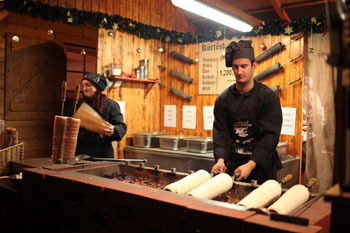 The city’s other scenic Advent Festival is at the Castle Garden Bazaar (Várkert) in Buda. 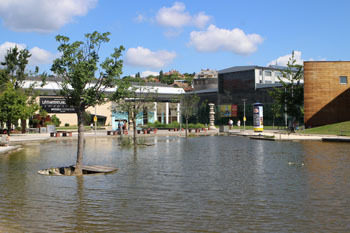 craft fair and workshops and other children activities on Sundays between 02 – 23. December, 2018. 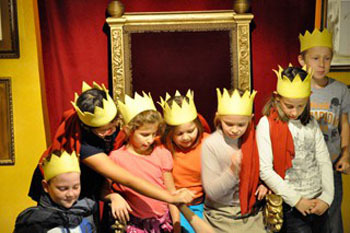 TIP: The Miniversum Interactive Train exhibit also has fun programs during the Christmas – New Yar period. 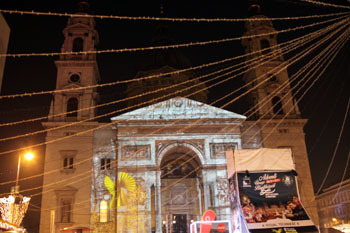 Winter Festival at the Palace of Arts/Müpa, till 06. 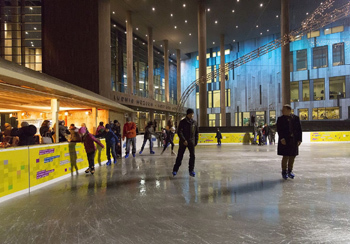 January 2019.
ice rink (open: weekdays: 14.00-20.00, weekends: 10.00 – 20.00, 22. Dec – 02. Jan: every day: 10.00-20.00, closed on 24. Dec, 25-26 Dec & 01. 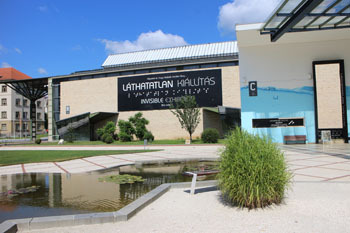 Jan: 14.00-20.00), Admission: a valid ticket to a program in Müpa. a tent next to the rink where children programs, concerts, contemporary circus performances take place. Although the list of child-friendly restaurants is not long, you’ll find some very family-friendly restaurants in Budapest. These restaurants provide for high-chairs, but to be on the safe side always book one in advance. Most of these restaurants serve children’s menus. A charming cafe in Lipótváros district. Ideal for a leisurely breakfast or coffee with cake with kids. There’s a play area on the upper floor. They are also one of the few places that sell cronut – the famous, new American pastry – in Budapest. A bit out of the city center, up in the Buda Hills, but if you stay in the city for a longer period definitely try it. The simplest way to get there is by taxi. Shopping Centers in Budapest all have great toy shops. Most of the malls have kids’ corner or playhouse where you can leave your kids and the trained supervisors will look after them while you’re shopping. 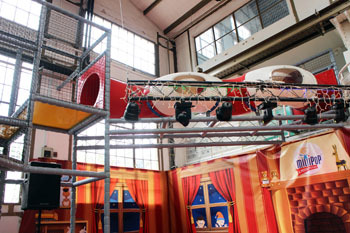 Slides, jumping castles and other games will keep your little ones amused. at Baross utca 46., district VIII. József krt. 50, district VIII. Erzsébet krt 23. district VII.